The year is 1508 AD. The Onin Wars have been over for 31 years and the Japanese era of civil war has begun. Hosokawa Matsumoto, the Kanrei or vice-Shogun, has just been assassinated and the region is becoming unstable without its primary leader. Who will take his place and bring leadership to the people? Matsumoto’s adopted sons, Takakuni and Sumimoto, both have scrolls declaring they are the heirs to their father’s title of Kanrei. The brothers charge to the battlefield fighting for their father’s title and for control of the region. Which brother will destroy the others scroll and become the next Kanrei? 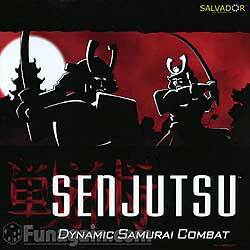 In Senjutsu, two players recreate feudal Japanese Samurai warfare in a unique clan vs. clan battle of customizable warriors. Strategy and replayability are found through various weapons, armory, and tactics cards available to modify and diversify warrior abilities.